Be amazed by the magic of a tropical sunrise as you sip an early morning coffee on your own private balcony wander down to the beach for an early morning dip. If you're feeling more energetic, take the walking track around the base of Earl Hill to the lookout for a superb view of Trinity Beach, the mountains and the islands off Palm Cove. With its understated elegance and variety of restaurants and entertainment offered on its beachside esplanade, Trinity Beach continues to grow in popularity with visitors and locals alike. Second floor studio apartment with partial views of the ocean which includes some of our beautiful tropical flowering trees. This room is comfortably furnished in tropical cane with Queen Bed. Self-contained with kitchenette and en-suite bathroom. Fully air-conditioned, ceiling fans, laundry on floor level and lift access to all rooms. Wall mounted flat screen TV's with Foxtel package. Sofa bed for extra person (extra charge). Direct access from property via steps to the beach, esplanade and restaurants. Ocean facing studios with large balconies. All studios have very pleasing partial views of the ocean which include some of our beautiful tropical flowering trees. Furnished in European style with Queen Bed or Twin option. Self-contained with kitchenette and en-suite bathroom. Fully air-conditioned, ceiling fans, laundry on floor level and lift access to all rooms. Wall mounted flat screen TV's with Foxtel package. Sofa bed for extra person (extra charge). Direct access from property via steps to the beach, esplanade and restaurants. Delightful airy studio rooms with two smaller balconies - one with partial views of the ocean and the other looking to the tropical hinterland. Furnished in European style with Queen Bed. Self-contained with kitchenette and en-suite bathroom. Fully air-conditioned, ceiling fans, laundry on floor level and lift access to all rooms. Wall mounted flat screen TV's with Foxtel package. Sofa bed for extra person (extra charge). Direct access from property via steps to the beach, esplanade and restaurants. For those travelling with another couple or independent children, the Ocean Suite has a dual key option combining an Ocean Outlook Studio with its companion Retreat. There is an option for twin beds in the Outlook Studio. Both are self-contained with kitchenette and en-suite bathroom. Fully air-conditioned, ceiling fans, laundry on floor level and lift access to all rooms. Wall mounted flat screen TV's with Foxtel package. Sofa bed for extra person (extra charge). Direct access from property via steps to the beach, esplanade and restaurants. Stunning, uninterrupted views overlooking the ocean from a large balcony. Furnished in European style with Queen Bed. Self-contained with kitchenette and en-suite bathroom. Fully air-conditioned, ceiling fans, laundry on floor level and lift access to all rooms. Wall mounted flat screen TV's with Foxtel package. Sofa bed for extra person (extra charge). Direct access from property via steps to the beach, esplanade and restaurants..
Delightful airy room with two smaller balconies - one with magnificent views of the ocean and the other looking to the tropical hinterland. Self-contained with kitchenette and en-suite bathroom. Fully air-conditioned, ceiling fans, laundry on floor level and lift access to all rooms. Wall mounted flat screen TV's (Free-to-air only). Sofa bed for extra person (extra charge). Direct access from property via steps to the beach, esplanade and restaurants. Magnificent ocean views from the top floor. This studio comes with twin bed option. 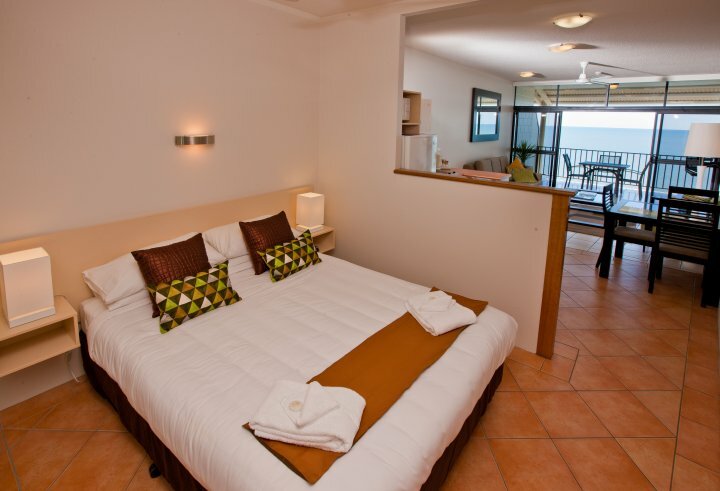 Ocean facing balcony, self-contained with kitchenette and en-suite bathroom. 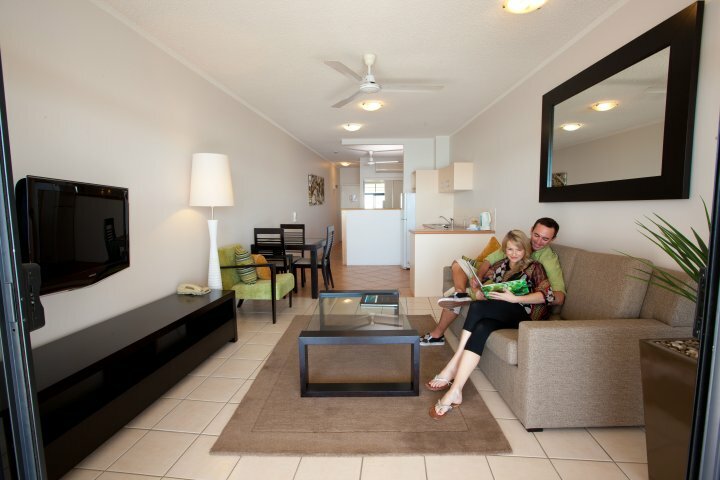 Fully air-conditioned, ceiling fans, laundry on floor level and lift access to all rooms. Wall mounted flat screen TV's (Free-to-air only). Sofa bed for extra person (extra charge). Direct access from property via steps to the beach, esplanade and restaurants. For those travelling with another couple or independent children, the Top View Suite has a dual key option combining the Top View Studio with its companion Top View Retreat room. There is an option for twin beds in the Top View Studio. Both are self-contained with kitchenette and en-suite bathroom. Fully air-conditioned, ceiling fans, laundry on floor level and lift access to all rooms. Wall mounted flat screen TV's (Free-to-air only). Sofa bed for extra person (extra charge). Direct access from property via steps to the beach, esplanade and restaurants. For those travelling with another couple or independent children, the Tropical Family Suite has a dual key option combining a Tropical View Studio with its companion Retreat. There is an option for twin beds in the Studio room. Both are self-contained with kitchenette and en-suite bathroom. Fully air-conditioned, ceiling fans, laundry on floor level and lift access to all rooms. Wall mounted flat screen TV's with Foxtel package. Sofa bed for extra person (extra charge). Direct access from property via steps to the beach, esplanade and restaurants. Ground floor studio with filtered views of the ocean through beautiful tropical vegetation. These rooms have access to a grassed area off the front tiled balcony Self-contained with kitchenette and en-suite bathroom. Fully air-conditioned, ceiling fans, laundry on floor level and lift access to all rooms. Wall mounted flat screen TV's with Foxtel package. Sofa bed for extra person (extra charge). Direct access from property via steps to the beach, esplanade and restaurants. Wireless broadband access fax facilities internet cafes nearby. Reception hours are 0800 to 1800. For after hours check-in, or to arrange Airport Transfers (extra charge) please contact Amaroo at Trinity at info@amarooresort.com. Extra person charge $35 per person per night. Infants and children up to 2years old free of charge when using existing bedding, otherwise extra person charge applies. Covered car parking available free of charge. 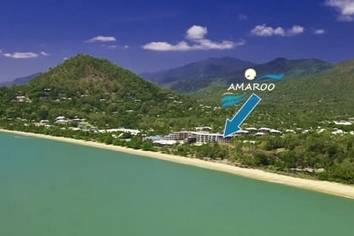 Trinity Beach is only a short drive away from Palm Cove. The local bus service also provides access. 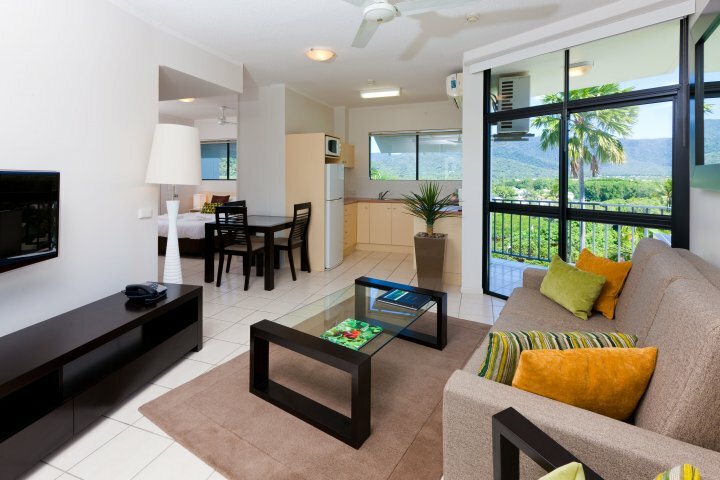 Twenty minutes drive north from Cairns International Airport along Captain Cook Highway. Turn right at the Trinity Beach Roundabout and follow Trinity Beach Road to Moore Street, turn left and travel approx 200metres to find Amaroo At Trinity on right hand side. Talk to our Tour Desk about your tour itinerary, take advantage of the- free service and local experience etc. We will help you make your holiday what you are looking for. Relax at Trinity Beach in between your choice of many tours and activities in the area, including Skyrail, Kuranda Scenic Railway, Daintree Rainforest and Cape Tribulation, the scenic Cairns Highlands, snorkelling, diving, and just simply admiring the wonders of the Great Barrier Reef.